I am a Front End Web Developer & Online Marketer based in the beautiful town of Louisburgh, Co. Mayo, Ireland. Although my title is web developer, I like to think that I am much more than that. I have degrees and diplomas in many different areas, all of which help me to deliver the best experience to my clients. Obviously I am trained in web development, WordPress development and graphic design, but also in areas like photography, digital video, viral marketing, digital marketing, social media marketing, SEO & online reputation management, blogging & content marketing, the list goes on… I have learned everything that I can in order to deliver the best possible experience, from start to finish, for my clients. I will install and set up the Genesis Framework ($75 value) and a StudioPress child theme ($50 - $120 value). 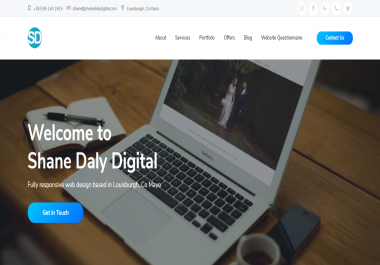 These are fully responsive themes that are SEO friendly, have fast loading times and are written with clean, well annotated code. I will set up the theme in line with the demo and will customise the theme with your brand's logo, colours and fonts (custom fonts must be supplied). I can set up email contact forms and responsive galleries (images must be provided). A basic level of customisation will be available but fully customised functionality will not be included in this offer. WooCommerce can be integrated with all StudioPress themes but product creation is not included in this offer.